SmartMouth’s Dry Mouth Mouthwash formula combines dry mouth relief and bad breath prevention to rehydrate a dry mouth. Combined with dry mouth mints, you have the ultimate remedy for dry mouth. Why use SmartMouth to relieve dry mouth? Whether it is due to dry mouth from medications, behavior, or diet, dry mouth is an annoying problem. 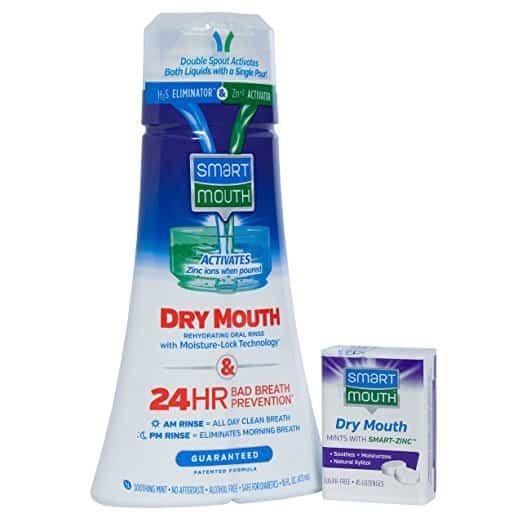 SmartMouth Dry Mouth Mouthwash features moisture-lock technology to moisturize dry mouth. SmartMouth products do not contain alcohol but soothe with a refreshing, non-burning, mint flavor. Learn more about how SmartMouth’s activated technology works.